Screen Rooms by Roofing Renovations can add livable space to your home. With a screen room, you have a few different options. Most of your traditional style is going to be either a two or four inch extruded frame with screen stretched in between it. Then you put a screen door in there, whatever you want. We also have some other options on the screen. 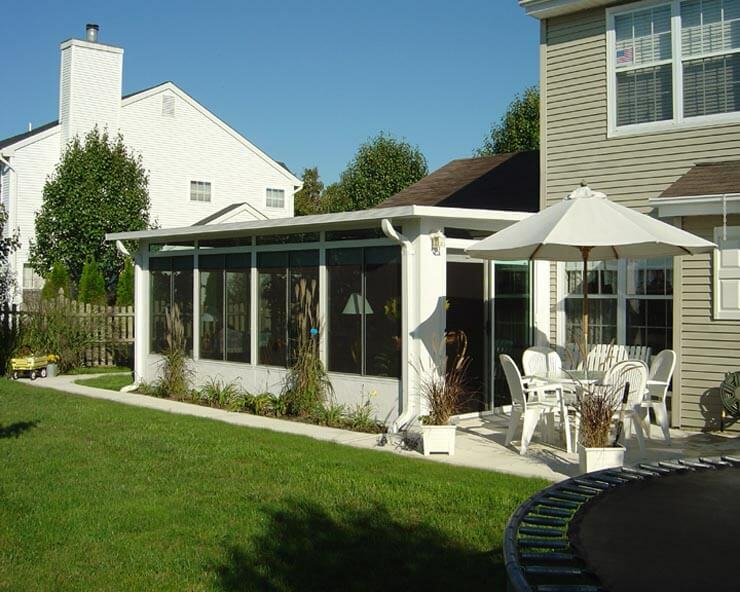 We have retractable screens to where we can fill some big, wide openings with retractable screens, which gives you the option to have an open patio area or to close it in with screen, away from the bugs. Depending on the parts you go with, they can come with a 10 to 20 years warranty. Does the sunroom add square footage to the house? One of the major advantages of adding a sunroom to your home is the bonus square footage, as long as it’s heated and cooled, as 90% of surooms in Middle Tennessee already are. In order to be counted, it’s got to be livable space. When you add a sunroom, you’re not just adding real square footage to your Middle Tennessee home, but you’re also going to see roughly a 60% to 70% return on your investment as soon as the build is completed. There are many factors to consider when you decide to add a sunroom to your home, and the roof is one of the big ones. If there is already an existing roof, it really makes sense to build a sunroom; you’ll see almost 100% returned on your investment for that square footage, as you won’t need to pay to have a roof installed. If you do need to have the roof built over your sunroom, you’ll typically see about 60% to 70% return on your investment when you add that square footage into the home. Right now, sunrooms are on the rise in Middle Tennessee. Murfreesboro, in particular, is experiencing a major real estate boom. Many homeowners are considering a move to increase their square footage, and as soon as they put their house on the market, they’re fielding offers from six or seven buyers. While that might sound like a dream, it can quickly turn into a nightmare when they go out to find a new home and find that they’re in for stiff competition wherever they look. Instead, many homeowners looking for more space are opting to add square footage to the home rather than taking on the stress of trying to find a new home in a seller’s market. Adding a sunroom is a quick, inexpensive way to add square footage to the home, and once the sunroom is added, homeowners find that it quickly becomes the most frequently used room in the house.